Since the beginning of the year, a worldwide Iranian-sponsored terrorist campaign against Israeli targets has been underway. Several attacks were foiled until mid-July, Bulgarian citizen, and wounding some 30 Israelis. In February, seven Iranian citizens were involved in a plan to carry out attacks against Israeli diplomats in Bangkok; three members of a Hizballah-Iranian cell were arrested in Singapore for plotting to assassinate visiting Defense Minister Ehud Barak; in India police arrested an Indian journalist, a part-time employee with an Iranian broadcaster, and an Indian court issued arrest warrants for four suspected members of the Iranian Revolutionary Guard for their alleged roles in the February 13 bombing of an Israel Embassy car, in which the wife of the defense attaché was injured. In mid-March, Turkish security authorities foiled an Iranian terror plot against Israel’s diplomatic missions involving four members of the Revolutionary Guards’ Quds Force. In mid-June, two arrested Iranians were accused of planning bombing attacks on Israeli and Western targets in Kenya. And in July, Cypriot authorities arrested a 24-year-old Lebanese Hizballah operative who targeted Israeli flights and tourist buses. Some argue that in their global campaign the Iranians are retaliating for Israel’s alleged assassination of Iranian nuclear scientists. 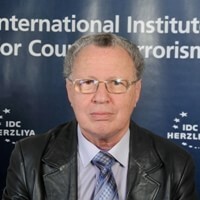 But I believe they have a far more sinister strategic goal: To provoke a regional conflict between Israel and its neighbors that would divert international attention from Iran’s nuclear program. As pressure on the Iranians mounts, they are being driven to des- perate measures. Besides the international economic sanctions, they are losing coalition partners: Hamas has deserted in favor of the Egyptian Muslim Brotherhood and the Bashar Assad regime is on its way out in Syria. The Iranians believe they have little to lose. Based on past experience, they know that the governments of the countries targeted by the terrorist campaign will exact only a negligible political price. Indeed, despite the involvement of seven Iranian citizens in the terrorist attempts in Bangkok, there was no diplomatic reaction by the Thai government; Indian authorities declined to implicate Iran in the February 13 attack and rushed to buy more Iranian oil; a Kenyan judge released the two arrested Iranian terrorists on bail. Moreover, a recent Israeli attempt to convince the European Union to place Hizballah on the terror blacklist also failed. The arrest of Hizballah terrorist operatives in so many countries, including Cyprus, which holds the EU’s rotating presidency, was not enough to satisfy the Europeans. Nor was the renewed indictment by the UN Special Tribunal of four Hizballah members for the killing of former Lebanese Prime Minister Rafik Hariri. The international community should not be surprised if its continued weakness and vacillation help convince Iran that it can get away with triggering a regional war that shifts the focus from the centrifuges spinning in Natanz and elsewhere.